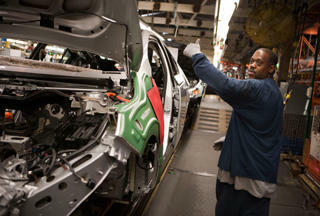 Workers at GM plants in Hamtramck and Warren are among the 14,000 expected layoffs at the auto company. Ballard says that North American auto sales have been fairly flat over the past several years, and that there isn’t much room for them to grow. “We used to buy passenger cars. We used to buy sedans. Now, that’s less than a third of the market. The market is in crossovers, SUVs, and pickups. And so the plants that are closing — and the plants that might be vulnerable for future closing — are the ones that make these vehicles that are less popular than they used to be,” Ballard explained. Ballard describes the plant closures as “a blow to a community’s sense of itself.” It will result in the loss of around 14,000 jobs nationwide, including thousands of both blue and white collar jobs in Southeast Michigan. It’s likely that businesses near closing plants will lose customers and that local governments will experience a decrease in revenue. However, Ballard also says that a changing automotive industry could provide incentive to further diversify Michigan's economy. “There are a lot of other sectors where I think we could do more. We could do more probably to promote tourism, more to try to attract finance and insurance. There are a lot of things going on in the economy outside of manufacturing, and that’s going to be true for a very long time,” he said. Auto workers who will be out of a job in 2019 may have trouble finding a comparable position. But Ballard says he’s optimistic that many of these people will land on their feet. “Right now, our unemployment rate is lower than it’s been since 2000. Our economy is continuing to grow, and so at least for a lot of those workers, I’m very hopeful that there will be good opportunities,” Ballard said. Listen the full conversation above to learn more about the rationale behind General Motors’ decision, and why Ford Motor Company may also reduce its automotive production in coming years.